Nano. Pico. What's next and what's important? Ever wonder how manufacturers come up with product names? Often we just take them for granted, as if the name of the product was just somehow intrinsic to the product itself. We don't think about product names too much. Or maybe we do, but we do it subconciously. Household names like Swiffer, Kleenex, Q-tips, Ziploc, and Windex are all examples of product names that people know so well that they've become the generic terms for entire categories of products. I mean, who wants to say "cotton swab" when they can say "Q-tip" instead? Or "resealable plastic bag" when "Ziploc" just rolls off the tongue? We've seen this happen in the sleep therapy device industry to a certain extent with trade names like BiPAP. BiPAP is a trademark of Philips Respironics, but nearly everyone calls a bi-level CPAP machine a BiPAP machine. To a slightly lesser extent people in the industry also use the trademark "C-Flex" (another achievement in naming from Philips Respironics) to describe the exhalation pressure relief feature available on many different CPAP devices. So, what about other sleep therapy products? How are they named? What do they mean? And will the names stick? And is any of it important? I got thinking about this issue a few months ago in February when Philips Respironics announced a mask called the Pico. I immediately thought to myself, "Pico? What the..." and then in the next instant I realized the reference was to a unit of measurement. After a quick Bing search (yes, I use Bing primarily over Google for reasons I'd be happy to share if you're interested), I confirmed the word Pico means "one trillionth". In other words, it's a word referring to something really, really small. I know you're still wondering: why Pico? I'll tell you. A few year ago ResMed released a mask called the Mirage Micro. One of the last masks released by ResMed was called the Swift FX Nano. Everyone knows the prefixes micro and nano both indicate certain levels of smallness. Like iPod Nano. Right? 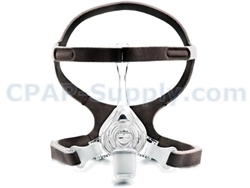 So, the ResMed names incorporating the words micro and nano just seemed normal to suggest a small, lightweight and comfortable CPAP mask design. But then along came the Pico, and I realized we've got a little competition going between two manufacturers. It reminds me of safety razors for shaving. Two razor blades used to be the cat's meow. The bees knees. A veritable triumph in the design and manufacture of razor blades. Then it was three blades. I think all the reputable manufacturers skipped four blades and went straight to five. After I went out and bought my new 5-bladed razor I half expected to see ads promoting the new 6-bladed razor . That ad never came, thank goodness. If little competitions like this between manufacturers continued ad infinitum we'd all need cranes to lift our cell phones and razors and TVs and everything else for which the phrase "bigger is better" often applies. Okay. So micro means one millionth, nano means one billionth, and pico means one trillionth. So ResMed's mask names of Mirage Micro and Swift FX Nano lose to Philips Respironics' mask name of Pico. The Pico must be smaller, lighter, better, whatever. Right? Maybe, but size and weight won't be the only factors when people decide for themselves which mask to buy. I'm not convinced any of these would make good names for CPAP masks, although Zepto is pretty cool. I could imagine Fisher & Paykel, perhaps, releasing a mask called the Zepto. Or the Otpez. After all, it was F&P who brilliantly derived the mask name Eson from the word Nose spelled backwards. I mean, those guys are thinking outside the box, aren't they? Maybe F&P has already applied for a trademark for Ecaf (face spelled backwards), or Yresim (misery spelled backwards). Or how about the new F&P Trofmoc Emerpus? The sky is the limit. I think I could get into this marketing thing. So here we are, discussing in detail product naming while the average CPAP user still cannot remember, or even pronounce, manufacturer names like Respironics, DeVilbiss, or Fisher & Paykel, let alone product names like PR System One REMstar 60 Series, Mirage Quattro, or Pilairo Q. Whether it's the Micro, the Nano, the Pico, or the Zepto, the major manufacturers in the sleep therapy device industry may be missing the boat completely in terms of branding and brand awareness. Take a look at some of the smaller manufacturers like APEX with their XT Fit. Or HDM with their Z1. No stuttering or stammering over those names. If only the others could hear customers try to pronounce their names and some of their product names over the phone! And shouldn't branding be less of a priority than actual product design, which seems somewhat stagnant in this industry? I mean, you should have the branding thing, and the easy product identification (ever try to identify your ResMed mask?) which is part of the branding. But that should be super easy and should always take a backseat to function. I recently talked with a senior level exec at a machine manufacturing company that I will not name here. I brought up the issue of noise as a specific complaint raised by many users of a particular CPAP machine made by this company. Even though I was expressing a sentiment shared by a large number of CPAP users - and not just our customers, it's a common theme in other online forums - the noise complaint was essentially dismissed as a non-issue. The same exec was delighted by the company's marketing efforts, though, which could probably be summed up by pragmatic people like myself as "useless". I'm not making this up. It's a true story. And if any of the manufacturers read this, they're all going to think I'm talking about them, because that's just sort of the way it is. It's the culture in the industry. They all talk a big game about patient outcomes and device effectiveness, but the reality is most people still quit CPAP, while the manufacturers don't lose any sleep over any of it (pun intended). So as not to offend, can I say this to the manufacturers: "If you're reading this, I'm not talking about you specifically!"